Living cells exist in a liquid environment that needs to be regulated so that they function correctly. The plasma membrane has regulates the movement of solutes (molecules, ions) from one side of the membrane to the other. Sometime the cell may need to move things in a direction they normally would resist moving in, against the concentration gradient. Plasma membranes are selectively permeable, which means that they act as barriers to most molecules and ions. Some substances (e.g water) are able to enter the cell through processes that require no expenditure of cellular energy (passive transport), while other substances require energy to enter the cell (active transport). Passive transport involve processes that do not need energy to move materials across membranes, and moves materials from high to low concentrations. The rate of passive transport increases when there is a high concentration gradient, the particle size is small or at higher temperatures. Diffusion refers to the random movement of particles in liquids and gases resulting in net movement from an area of high concentration to an area of low concentration (along a concentration gradient). It does not need energy, and can only occur when a concentration gradient exists between two areas. Uncharged Small molecules like oxygen, carbon dioxide, vitamins A and D and ethanol diffuse freely across membranes, with the direction of movement being dependent on their concentration. Large molecules like starch are prevented from diffusing through the membrane as they cannot pass through the pores in the membrane, so must use a transport (channel or carrier) protein to be transferred. When substances are being diffused they have a net movement. Particles diffuse randomly in all directions, however the net/overall direction of movement is from the are of highest concentration to the area of lowest concentration. Molecules that cross the membrane faster then is possible from their concentration gradient do so by facilitated diffusion. It moves large, polar (such as sodium and chloride) or water soluble particles that are unable to diffuse directly through the phospho lipid layer of the cell membrane by using a carrier or channel molecule/protein. Special transport o﻿r carrier proteins in the membrane provide channels for the process. Carrier proteins are specific (carry only one type of molecule). Channel transport proteins create "pores" in the membrane through which particles can diffuse. Each molecule passes through a specific pore and can't pass through the pore of another type of particle. Different types of cells will have different numbers of a particular channel depending on the job of the cell. Carrier proteins in the membrane change shape (not requiring energy) when particles bind to them, creating a channel for the particles to pass through. As one side of the membrane "opens" the other side "closes" creating a "kissing gate" effect. Larger particles, such as glucose and amino acids are unable to fit through channel proteins pass through the membrane in this way. Both glucose and ﻿oxygen can be facilitated in their diffusion into cells. The protein cytochrome P450 can transport oxygen up to 1.8 times faster across the membrane than it c﻿an travel by simple diffusion. The diffusion of glucose into cells can be facilitated by the hormones insulin (a protein) which may activate transport channels. Oxygen and glucose are facilitated across cell membranes as large amounts of each are needed rapidly for aerobic respiration in mitochondria (e.g cells of working muscles); simple diffusion is too slow. Facilitated diffusion is a passive process due to the molecules only being able to diffuse from a high concentration to a low concentration across the membrane. Osmosis is a passive process- a special case of diffus﻿ion It ﻿does not require energy. 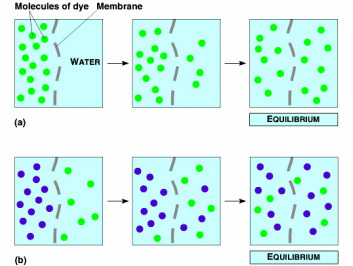 Osmosis is the net movement of water molecules across a selectively permeable membrane﻿ (a membrane which only allows certain substances through)﻿ from an area of high water potential (low solute concentration) to an area to an area of low water potential (high solute concentration) until water potentials are equal. Water molecules are small and some can move through the membran﻿e (most ﻿move through the channel protein), the other molecules in the solution are too big. As osmosis occurs down a concentration gradient, it follows the same rules as diffusion and is a passive process (no energy required). There is high water potential when water has few particles (solute) dissolved in it. A 5% saline (sea water) solution would have a higher water potential than a 10% saline solution, therefore water would move across a membrane from a 5% saline solution into a 10% saline solution. A solution is where a solute is dissolved in a solvent (liquid). A weak or dilute solution (little dissolved solute/high amounts of water) is a hypotonic solution. A strong or concentrated solution (much dissolved solute/ low amount if water) is a hypertonic solution. Two solutions with the same concentrations (same concentration of water and solute) are isotonic solutions. Large solute particles, for example, sucrose, are too large to pass through the semi permeable membrane. This causes the water to move until the concentration gradients are equal in both areas (isotonic). As diffusion and osmosis result from random movement of particles, the particles move in both directions across the membrane. However, the net movement is towards the area of lower concentration. Osmoregulation is the control of water inside a cell or organism. This is very important if you are a unicellular organism living in fresh water. Water is continually moving into the organism by osmosis (passive transport) and unless the excess water is removed the unicellular organism will explode/die. To prevent this,the unicellular organism has contractile vacuole which collect and pump the excess water out of the organism (active transport). The cells become flaccid and the plant wilts if it is non-woody. The cell becomes plasmolysed in hypertonic solutions- as water drains from the vacuole and the membrane and cytoplasm pulls away from the cell wall due to loss of water from the cell vacuole (this is if the cell continues to lose water after becoming flaccid). 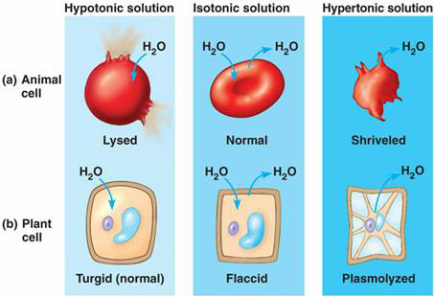 become firm in hypotonic solutions- as water fills the vacuole and the cell membrane presses against the wall; they are said to be turgid. The cell wall stops plant cells from bursting; no more water can enter. The resulting pressure from all cells being turgid, called turgor pressure, keeps a plant upright if it doesn't have a woody stem. 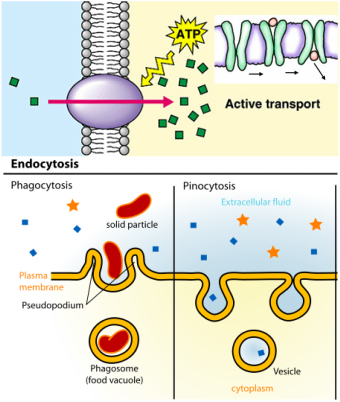 Active transport is a process that needs energy in the form of ATP (adenosine triphosphate, the energy carrier molecule in all living cells) from cellular respiration to move materials (molecules and ions) by the assistance of enzymes across membranes from low concentration to high concentration. Only carrier proteins can carry out active transport, not channel proteins. Research suggests that active transport of substances across membranes is by the large proteins embedded in the phospholipid bilayer. The substance temporarily combines with the carrier protein, which changes shape (using energy) as it discharges the substance to the other side of the membrane. The substance being transported detaches from the carrier protein when it reaches the other side of the membrane and the carrier protein regains its shape. Such carrier proteins are likely to be specific (carry only one particular substance). This process requires energy in the form of ATP (produced during respiration)- about a third of a cell's energy requirement may be for active transport. Cells undergoing a lot of active transport will have large numbers of mitochondria and use up large amounts of glucose and oxygen while producing large amounts of carbon dioxide and heat (in respiration). Cytosis is the movement of large amounts of substances into/out of cells by the folding of membranes (changing shape). Endocytosis is the taking of substances into the cell be the infolding of the cell membrane to produce a vesicle/the engulfing of material by the plasma membrane to form a small sac or "endocytotic vacuole". Fluids are taken in by pinocytosis ("cell drinking"), in which the membrane makes small infoldings, taking in droplets of fluid. The membrane then pinches off forming a vacuole around the droplets; the vacuole is now part of the cytoplasm in the cell. This process also works in reverse, removing droplets from a cell. Large particles ("food") are taken in by phagocytosis ("cell eating"), in which the membrane appears to flow around the particle, fusing when the two outflowings meet, then closing off to form a (food) vacuole (e.g white blood cells/phagocytes consuming bacteria; Amoeba consuming food). Typically, lysosomes join with the food vacuole and the food is digested. Exocytosis is the removal of substances from the cell by vesicles fusing with the cell membrane, and essentially is the reverse of endocytosis. It occurs when a cell needs to secrete a substance (e.g a hormone). Endocytosis removes part of the cell membrane, while exocytosis adds to the cell membrane. Energy is involved in the addition/removal/movement of membranes, so cytosis is active transport. An ion pump is the transportation of ions against a concentration gradient through the membrane using the energy from ATP. Cells are typically microscopic (the exceptions are some eggs- technically, the yolk of a bird's egg is a cell; frog's eggs are visible to the naked eye; the human egg is the size of a full stop). The need for cells to be small relates to their dependency on diffusion for getting substances into and out of the cell. When cells grow, their volume (the cytoplasm and contents) increases at a much faster rate than their surface area (the cell membrane. This is because volume (V) increases by a cube factor, while surface area (SA) increases as a square factor. As a cell grows, the ratio between surface area and volume (SA:V) decreases. Thus as a cell grows, the comparatively less membrane for substances to diffuse through and comparatively more cytoplasm/organelles that need these substances. This means that as a cell increases in size, the efficiency of obtaining substances via diffusion decreases. Diffusion becomes less efficient, and, beyond a certain size, the center of the cell does not receive the needed substances. At this stage, the cell stops growing. It may then divide to form two new, smaller cells, which have a larger SA:V ratio so substances can diffuse efficiently throughout the cell. This stops the cells from having a distance that is too large for substances to cross in time for what they are needed for. folding if the cell membrane- microvilli occur in both secretory cells (e.g pancreatic cells producing enzymes) and cells that absorb large quantities of substances (e.g cells lining the small intestine absorbing nutrients, and cells lining the kidney tubules re-absorbing essential substances such as glucose)- allows for rapid diffusion. Plant cells are usually larger than animal cells, because their center is typically occupied by the large storage vacuole. The vacuole is centrally placed, as it is not dependent on receiving substances diffusing in across the membrane. Organelles that are dependent on diffusion of substances such as chloroplasts (carbon dioxide in, oxygen out, better exposure to light) and mitochondria (oxygen in, carbon dioxide out) are pushed closer to the cell membrane. The principle of greater rate of activity with an increase in SA:V ratio occurs at all levels of biological organisation.